Alright, here we go! This is the final dashboard built with the name data from U.S. social security cards from the 20th century. At first glance, this chart looks simple, but that little slider in the bottom right hand corner enables you to make infinite bubble charts. This dashboard explores how many of those 32,600 unique names on 20th century social security cards we actually use. It turns out that an enormous percentage of our first names use a shockingly small set of names: 10% of the social security cards use just 6 names; 25% use 34 names; and 50% of the cards use just 148 names. If you’ve built dashboards 1 through 4, you’re ready for this challenge. You know the drill! 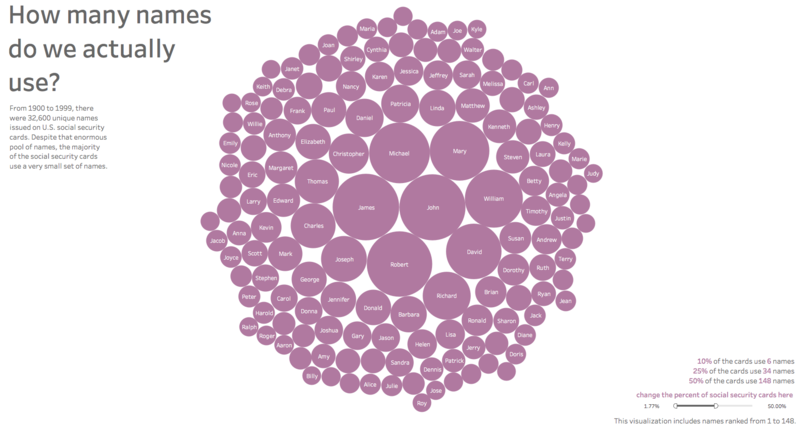 Fire up your own Tableau workbook and dive on in! Thanks so much for building Dashboard 5 with me! If you’ve built all five dashboards so far, well done! Those data viz skills are really coming into their own. Share what you’ve created in the comments below and let me know what you want to learn next. I’ll be back soon with a brand new data set. Until then, have a fabulous day!